I was so wrong when I said the Pretty Day & Night Clarins collection would (probably) be the last fall collection. Urban Decay came and now Inglot. I think this is the last fall collection of this year, will it be any good? I got the liquid highlighter, palette and lip liner, so that's what we will be reviewing today! Let's start with the pearl (in my opinion) of the products: the eyeshadow palette. This pigmentation is great, even the matte shade. They all need the lightest touch to give off full color. That's just Inglot as I know it. 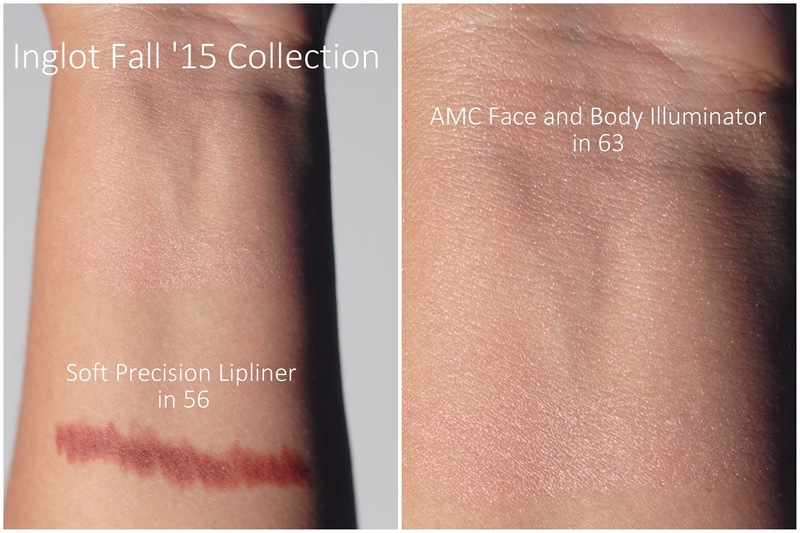 The soft precision lip liner in color 56 is a real fall shade, brownish-red. It has a soft, creamy texture and the pigmentation is good. Not much to say about it, it's a fine lip pencil. Okay, back to the highlighter. You can mix this with your body lotion, use it for strobing or as the finishing touch for your eyelook. Liquid highlighters are versatile, especially when they are subtle like this one and not too shiny. But it's also buildable, so if you dab it on, you can make the glow more intense. Yep, again a pretty collection. The palette is my favorite. Great pigmentation and pretty fall colors. I do like the formula of the highlighter, so I really want to try the yellow and silver one. Do you like pink highlighters and mustard eyeshadows? The palette is amazing! I didn't expect the colors to be this beautiful! Allereerst wil ik even zeggen dat ik echt super vind hoe je deze producten geshoot hebt. Het oogschaduw palette is een musthave! Ok that's it. I have tried so many times not to, but I have finally failed. Damn you and your blog! Het palette is echt mooi!